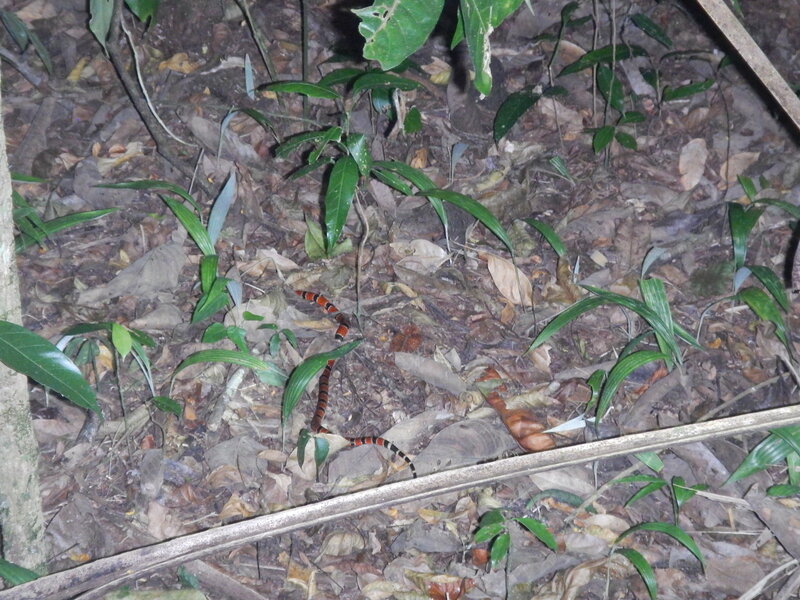 There we were, with flashlights in hand, meandering through the darkness of the Belize Zoo. 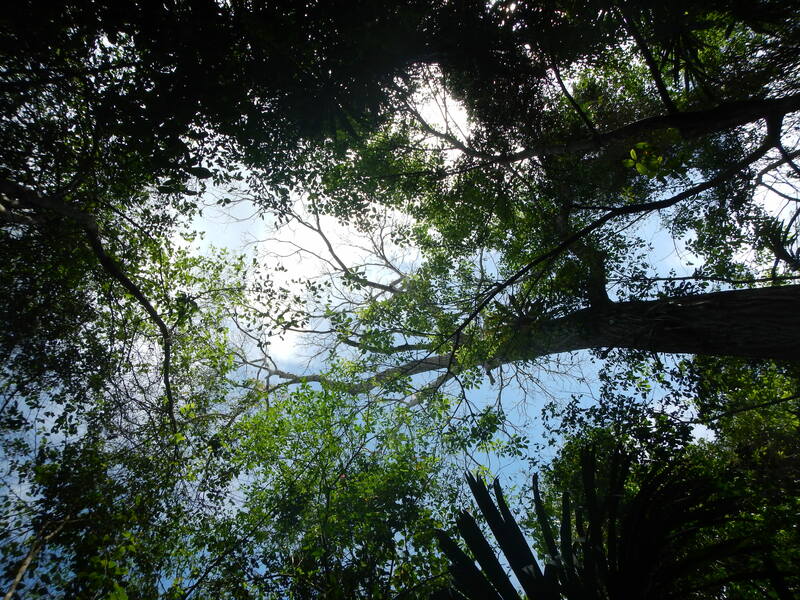 The site was sprawling with tall tropical trees, including the Santa Maria tree (Calophyllum brasiliense) and the gumbo-limbo (Bursera simaruba), spectacular sights on their own. The Santa Maria trees, not very common and interspersed between shorter trees, had branches high up on the trunk and were some of the tallest trees at the zoo. The gumbo-limbo trees were also fairly uncommon and were shorter with bark that was peeling in fleshy-looking pinkish layers. 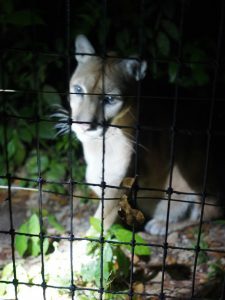 I was unable to see any animal activity in the trees because we visited the zoo at night. The trees were unscathed by the human activity necessary for the zoo’s survival; enclosures were constructed around established trees to preserve the integrity of the site. 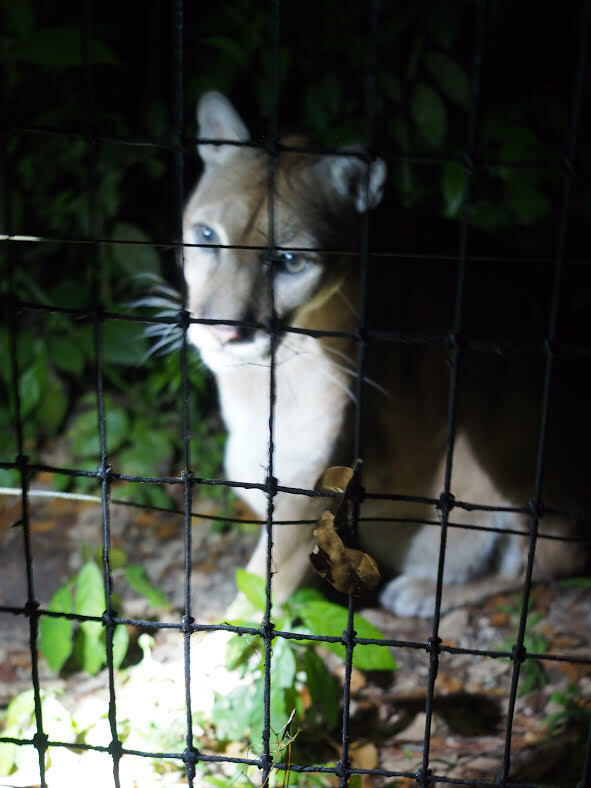 All of the zoo’s animals are native to Belize, and the zookeeper addressed each and every animal by name – Carlos the puma, Junior the jaguar, Maggie the frigatebird, Brutus the American crocodile. One could feel the zoo’s authenticity. The zoo lacked kitsch. It lacked glamour. It was about people learning about the animals of Belize. Earlier in the day, my class departed from Glover’s Reef, our home for the past week. 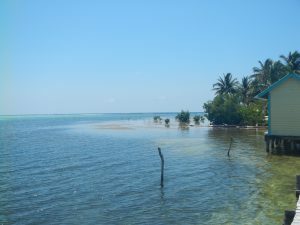 Partway through our boat ride to the Belize mainland, we hiked and snorkeled through the Belize mangroves. At a glance, the area would not have looked appealing, with its sediment-filled water, knotted overgrown tree roots, and an absence of colors other than browns and corrupted greens. However, the mangrove housed a wide variety of creatures. Today’s sightings covered the whole spectrum –red cushion sea stars (Oreaster reticulatus) to sun anemones (Stichodactyla helianthus) to a seahorse (Family Syngnathidae). The red cushion sea stars were amotile and were about six-inches in diameter. The most memorable sighting was a manatee (Genus Trichechus). Although I got little more than a glimpse of shimmery gray with chestnut speckles, it felt a sense an overwhelming sense of awe being in the present of a creature as majestic as a manatee. Ecologically, mangroves are essential to the survival of many types of animals, including coral-residing species, as the shallow waters and networks of plant materials protect growing animals from predators. Despite not being the most popular image to send home on a postcard, mangroves are a necessity for the survival of countless living things. Today began with at 4:45 with a sunrise – the first I’ve actively watched in years. I watched it alone, some much needed time to reflect. I felt sheer gratitude to witness such a glorious sight at such a special location. Later in the morning, my class and I boated out to three different reefs. The boatrides were spectacular, displaying discrete shades of blue. There was a crisp turquoise above sand patches, a deep muted turquoise above patch reefs, a dark royal blue across the horizon, and an electric, almost synthetic looking cerulean a short distance from the boat. 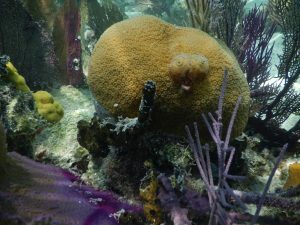 Each reef we visited had it’s own character and noteworthy residents. The first (“The Channel”) had mounds of corals in deeper water. A notable sighting was a cluster of three large gray angelfish (Pomacanthus arcuatus) that moved in tandem. The second reef (“The Aquarium”) consisted of shallow depths and very active fish. Two noteworthy sightings were a flounder under sand and a stoplight parrotfish (Sparisoma viride) that burped up algae. Today’s final reef was the same patch reef we visited yesterday and on our fist day snorkeling. The reef appeared more visible and felt easier to navigate. The most unusual animal seen there was a pufferfish (Family Tetraodontidae). I searched all three reefs for echinoderms. 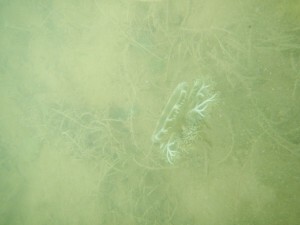 On the seafloor, I found a couple urchin skeletons, maxing at about two-inches in diameter, but nothing significant. Today’s lack of echinoderm encounters is likely because I did not overturn any rubble to look for them. 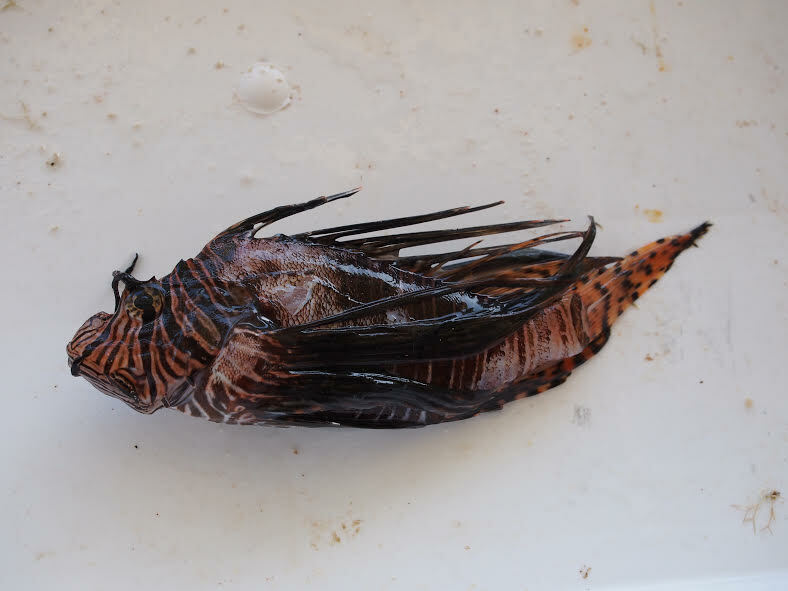 The afternoon was spent dissecting lionfish our instructors caught during earlier reef visits. It was interesting learning about how invasive species, like the lionfish, have had such harmful effects on ecosystems. It is truly astounding how many ecological and environmental issues humans have created. The world is so big, and I am just one of seven billion humans, which belong to one of six million animal species. 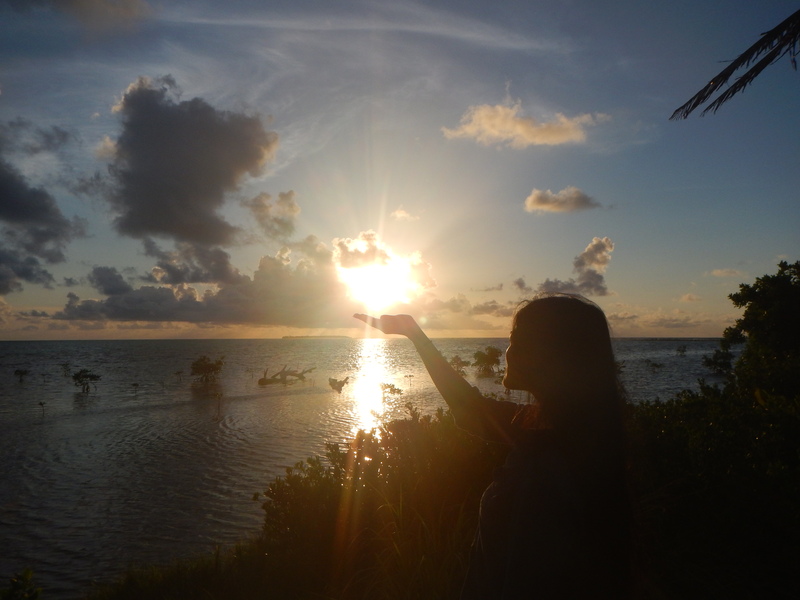 Gazing at the sun inch its way across the horizon compels me to think about my place in the world. What issues do I regularly encounter? Do I choose to intervene? How? Only time will tell how I will respond to the world’s future issues, but until then, I can take time to think. Today, it took a sunrise to force my to take time to introspect. Ordinarily, I constantly look and listen and study, but it is rare that I pause and think critically about the world’s issues and my role in their causations and solutions. That is something that I want to change. It can take very little to shift a perspective. Five days ago when I snorkeled for the first time, I felt overwhelmed with the entire situation. My mind was overloaded – unable to find the balance between managing my fins and mask, observing my surroundings, staying afloat, and not getting water in my snorkel tube at the same time. Each day marked an increased fluidity in the water, but this morning, I felt much more capable than ever before. I could focus less on the technical and more on the experience. This, in addition to the abundance of lively fish at the backreef, created an extremely rewarding explorative experience. 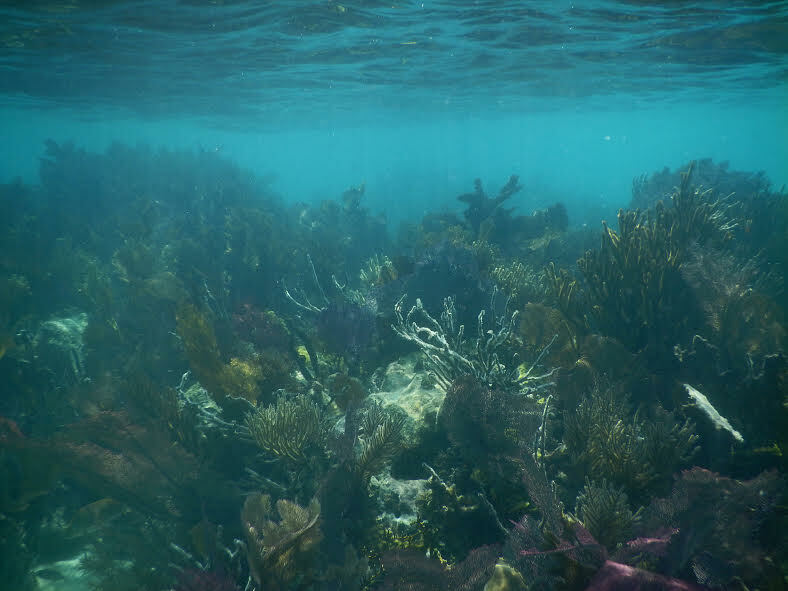 Today’s reef was shallow with large mounds of coral, saturated with brightly colored fish swimming in every direction. The fish were juveniles and adults, swimming individually or in schools, and represented every shade of color imaginable. I encountered many noteworthy creatures today at the reef – two more donkey dung sea cucumbers (Holothuria Mexicana) covered in algae, as well as urchins (Class Echinoidea) and many brittle stars (Class Ophiuroidea) underneath rubble. 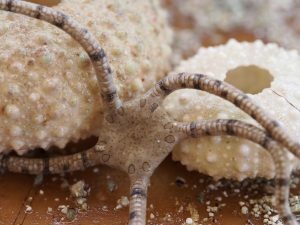 The sea cucumber and urchins were sedentary, but the brittle stars scrambled to conceal themselves as soon as they were exposed. 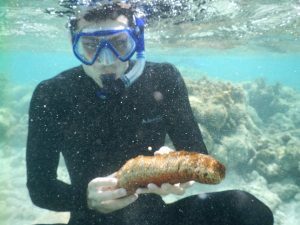 Size-wise, the urchins were on the small side, hovering about two inches in diameter, while both sea cucumbers were over a foot long. 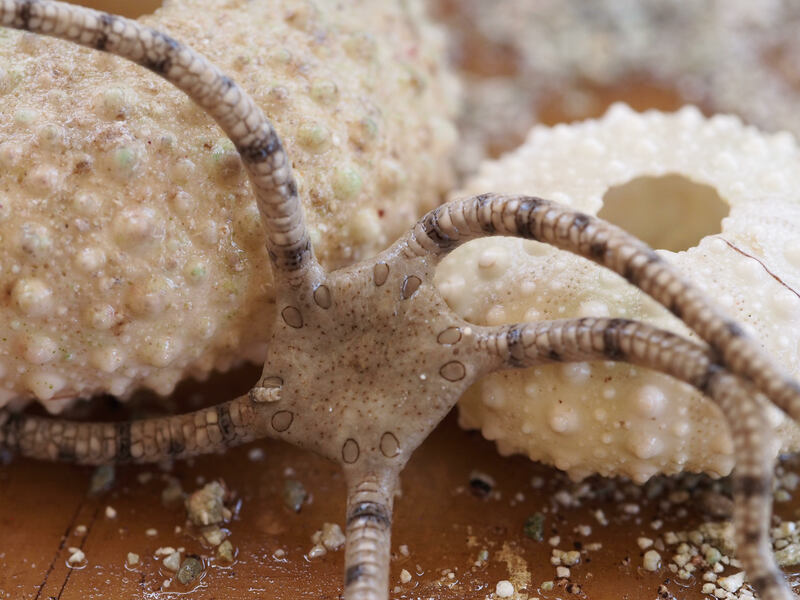 The brittle stars ranged from two-inches in diameter to about seven inches in diameter. I spotted another porcupine fish (Diodon hystrix) concealed under a rocky ledge. There were also many yellow-tail snapper (Ocyurus chrysurus) swimming around in groups. Today’s most vivid sighting was a scorpionfish (Genus Scorpaena), cryptically colored in shades of brown and beige to assimilate into the seafloor. Today, I realized my own perspective shift. Snorkeling no longer felt foreign to me, and I could fully immerse myself in the rich aquatic life surrounding me, creating my most fulfilling experience yet. I am more excited than ever to see what tomorrow will bring. This morning, my class and I explored one of Glover’s backreefs, noting densities of Christmas tree worms (Genus Spirobranchus). While my own data collection was less than fruitful, the outing marked a major victory for me as a tropical field biologist. I encountered interesting echinoderms like a donkey dung sea cucumber (Holothuria Mexicana) in a sea grass bed and a West Indian sea egg (Tripneustes ventricosus) partially covered with algae. Both were neither in motion nor interacting with other animals. My most memorable sighting was a Caribbean reef squid (Sepioteuthis sepioidea) swimming by. I swam after the squid for a while, trying to get a better look. The animal was iridescent and translucent, a visual schema difficult to describe with an ordinary color pallet. There is something about the ocean that compels organisms to take on the most astounding colors and sheens; it’s simply breathtaking. This same day, my classmate Isaac gave a presentation about the expansiveness and damaging ecological impact marine debris can have. My class also spent the afternoon collecting and measuring the debris accumulation from some of the shores of Middle Caye, which lies adjacent to a protected marine area. In my ordinary life back home, I contribute little to resolve this issue. Like most Americans, my status quo involves unbridled consumerism. An ordinary shopping trip involves buying excessively packaged goods from an energy-inefficient grocery store and taking them home in a disposable plastic bag. It is both interesting and unacceptable that such an irresponsible course of action is deemed ordinary in American society. Despite how ingrained reckless consumerist behavior is, conservation and preservation of ocean creatures is non-negotiable. Every living thing deserves a chance to not only survive but to thrive. Waste accumulation in our oceans, the direct result of human negligence, strips many living things of their chance for survival. For the long-term wellbeing of all living things, from reef squids to the human race, communities need to make thoughtful decisions regarding their own waste production and disposal. Literally, the fate of the world depends on it. I lie on my back on the hammock, swaying gently side-to-side in the breeze. My eyelids float down after a busy morning and afternoon. I witness deep oranges and rusty reds shifting, bursting, and intertwining on the backs of my eyelids, luminescent projections of the intense tropical sunlight. Needless to say, these entrancing visions were enough to lull me to sleep. This morning I felt quite different – energized and adventurous. Soon after breakfast, my classmates and I measured the sizes of the urchins we caught yesterday at the Marine Protected Area (MPA). 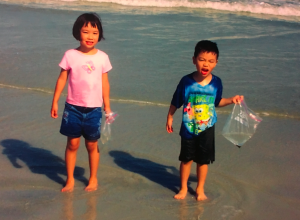 We then snorkeled at a non-MPA and carefully collected urchins there. Interestingly, the urchins tended to be larger and more numerous at the MPA. However, the non-MPA was home to the largest urchin we found, a long spine sea urchin (Diadema antillarum) that measured 5.8 cm in diameter. With its mounds of different corals, the reef visited today was teeming with a plethora of diverse colorful creatures. Some notable sightings included a green sea urchin (Lytechinus variegatus), spiny brittle stars (Ophiocoma paucigranulata), and numerous ctenophores. The green sea urchin was about 4 inches in diameter and found on the seafloor. The spiny brittle stars, found under rubble, had central disks of about an inch in diameter and arms about 3 inches long. The brittle stars would try to move back under the rubble when exposed. None of the echinoderms were visibly interacting with other organisms. Today’s most spectacular sighting was a spotted trunkfish (Lactophyrus bicaudalis); its dynamic black and white speckles contrasted with the mellow blue backdrop of the ocean. After spending the afternoon discussing my class’ data collected and observations noted, I was exhausted. We had an hour until dinner, so I lied on my back on the hammock. I’m up at 5:00 am. My bags are packed. I eat a PB&J, and we are on the road. The drive from the Tropical Education Center to the pier in Belize City isn’t too long – around 45 minutes. Our team transitions to the boat, and we are off on the two-and-a-half hour boat ride to Glover’s Atoll, our home for the next seven days. 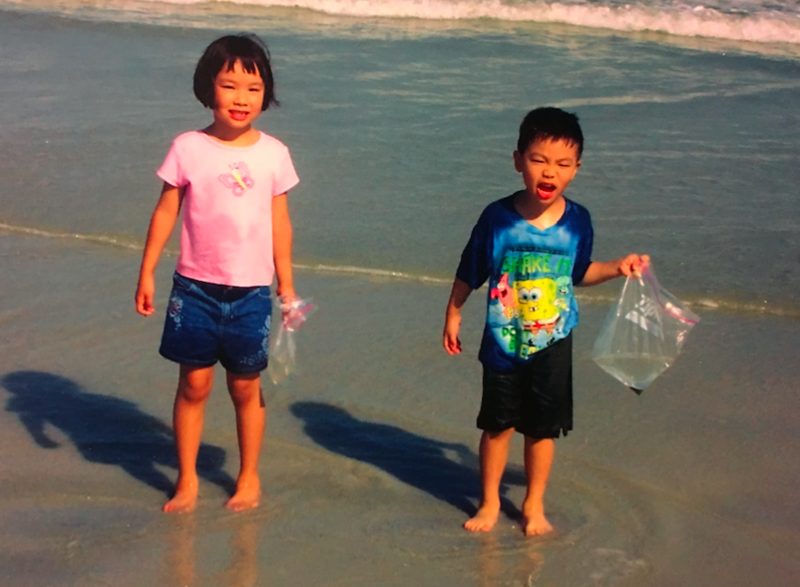 Soon after our arrival to Glover’s, we went snorkeling – my first time ever. The colors of the reef seemed like they were from a centuries-old oil painting. 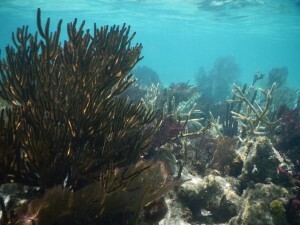 I was anticipating a full color pallet of hues, but the corals’ tones were warm-colored and muted. Snorkeling in the water seemed out of body – like I was an avatar in a video game. Still not fully used to the controls of this unfamiliar type of movement, I felt awkward in the water, despite swimming competitively in high school. Every movement was calculated, taking into full consideration each dimension of my unfamiliar setting – Who is behind me? Will I bump into any coral nearby? Is my snorkel still vertical? The reef was teeming with busy creatures. During my brief hour-long escapade, I encountered many types of fish, including baby barracuda (Genus Sphyraena), a baby nurse shark (Ginglymostoma cirratum), and a large southern stingray (Dasyatis americana). The only echinoderm I found was the bleached skeleton of a large red heart urchin (Meoma ventricosa) on the seafloor. The skeleton was about 6 inches in diameter and partially covered in algae. 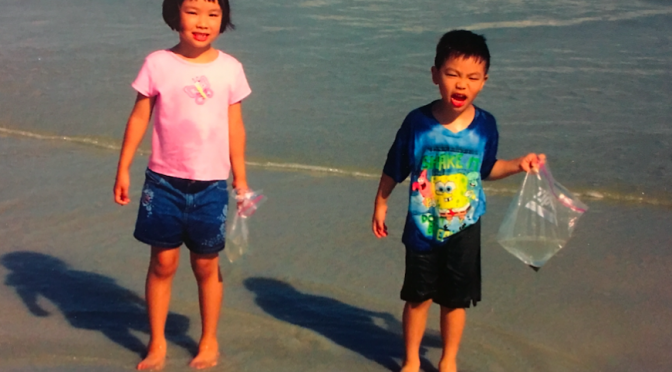 I also held a conch shell with a fleshy body inside. His eyes stuck out of his head like the eyes of Mr. Krabs from Spongebob Squarepants. My superstar sighting was a porcupinefish (Family Diodontidae) hiding under a rocky ridge. The fish was difficult to photograph, but with its massive size and bright colors, it was easy to remember. After the swim, we explored a coral graveyard, studying the skeletons of centuries-old corals. It was interesting to witness how corals vary in formational shape, as well as polyp size and arrangement pattern. After dinner, we closed the day with two taxon briefings (including my own on echinoderms). 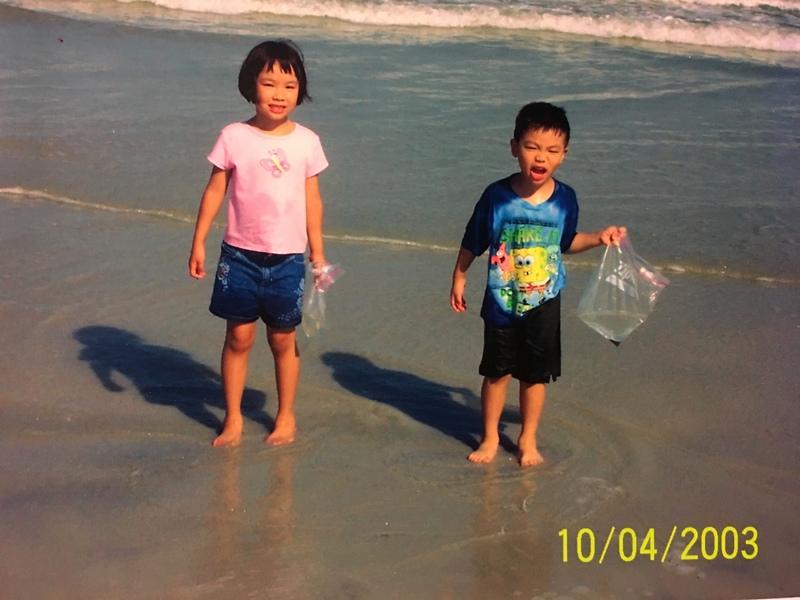 My first time in the water was surreal. I am eager for the next wave of adventures tomorrow will bring. I’ve been to Canada twice. Those are the only times I have ever left the United States. Tomorrow, my list will be longer. I will leave the U.S. for Belize. 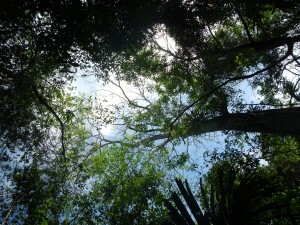 Belize will provide me with an unique opportunity to learn about new living things in new settings. As a lover of nature, viewing the coral reefs and rainforest Belize offers will be a fulfilling experience. I have never seen coral outside of a fish tank or on a piece of jewelry. Likewise, it has been a long, long time since I have seen a tree taller than 50 feet. I am excited to immerse myself in the unique land- and seascapes and gain perceptive of the natural wonders that lie outside of an American cityscape. I am most excited to see Belize’s natural colors – the lush green of the rainforest canopy, the crisp blue of the Caribbean sea, and the plethora of new colors I have not yet anticipated. My concerns? Just the uncertainty. There are a lot of unknowns. However, the uncertainty does not deter me. I am determined to grasp every opportunity, see every site, and learn as much as I can about each living thing I encounter. I’ve had my passport printed and ordered boots and fins and a snorkel and special adventurer pants. I’ve read hundreds of pages of facts. I have, for the most part, packed. I am ready. Nature is calling, and I am calling back.